The music streaming boom dominated 2017. Market statistics highlight that music streaming revenue has become the most important income stream for the phonographic industry. The US figures for 2016 highlight a tremendous shift from selling music (CDs and downloads) to accessing music (by streaming services). In the US, music consumers paid for the first time more for music access by ad-supported and paid streaming services (US$ 3.9bn) than for CDs, music downloads and ringtones (US$ 3.5bn). In the UK, the massive growth of music streaming revenue also increased overall recorded music sales in 2016. Gains of £103m in the music streaming segment, thus, compensated not just for the loss of £5.8m of physical sales, but also for the £56m decrease in download sales in a year-to-year comparison, as a long-term analysis of the UK recording sales indicates. We can, thus, expect a further massive growth of music streaming revenue in 2017 also on markets with a still strong physical segment such as Germany. The 8th Vienna Music Business Research Days on “Unchaining the Digital Music Business?” were held at the University of Music and Performing Arts Vienna from September 12-14, 2017. Over the past few years new gatekeeping processes in the digital music business have emerged and international music business experts, therefore, highlighted the role of new and old gatekeepers as well as the impact of innovative technologies such as the blockchain on structures and processes in the music business. Students from Austria, Bardados, Canada, Germany, Serbia and South Africa on a master and PhD level opened the conference with the Young Scholars Workshop presenting and discussing their research findings with reknown academics in the field of music business research (workshop program). The article “Virtual Songwriting: Fostering Creative Processes through ‘Challenge’ and ‘Collaboration'” by Benjamin Schiemer from the Johannes Kepler University Linz in Austria was awarded by an international jury as best paper and is considered to be published in the International Journal of Music Business Research (IJMBR). Music business researchers from Austria, Australia, Finland, Germany, Italy, Norway, Spain, United Kingdom and the US gathered on the conference track day (September 13) to present their recent findings on the music business and discuss them with the audience. The topics ranged from the economics of music festivals, music piracy, regulatory aspects in the music business and on choreographies to artist-fan engagement, music management, social media in the music business to the impact of blockchain technology on the music industry (see program). The invited conference day on September 14 highlighted the role of new gatekeepig processes in the digital music bsuines by new and old players of the music industry. Daniel Nordgård from the University of Agder in Kristiansand/Norway held the introductory talk on “New Gatekeeping Processes in the Digital Music Business” and moderated then a panel discussion with Sally Gross (University of Westminster, London), Sarita Stewart (Mike Curb College of Entertainment & Music Business, Belmont University Nashville/USA), Scott Cohen (The Orchard, London and New York) and Stefan Baumschlager (Record Bird, Vienna). In the following presentation George Musgrave from the University of Westminster in London talked on “Control and Autonomy in the Digital Music Business”. In the afternoon Alan Graham and Wolfgang Senges critically reflected in two keynotes – “The Applications of Blockchain Technology in the Music Business” and “The Benefits and Challenges of Blockchain Technology in the Music Business” the current hype about blockchain technology and discussed with Carlotta de Ninni (Mycelia for Music project) and Kelly Snook (University of Brighton) its impact on the music business. 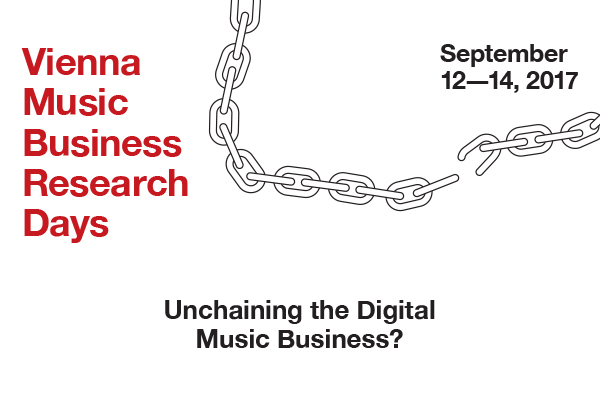 The 8th Vienna Music Business Research Days from Sep. 12-14, 2017 are devoted to the question “Unchaining the Digital Music Business?”. Over the past few years new gatekeeping processes in the digital music business have emerged and international music business experts, therefore, highlight the role of new and old gatekeepers as well as the impact of innovative technologies such as the blockchain on structures and processes in the musis biz. Find the program here. Carlotta de Ninni is one of the discussants of the panel “Unchaining the Digital Music Business” in Joseph Haydn-Hall on September 14 from 16:00-17:30. Other panelists are Kelly Snook, Professor of Media Arts Technology at the University of Brighton/UK), Alan Graham (OCL – OneClickLicence, London) and moderator Wolfgang Senges (ContentSphere, Berlin). Carlotta has a background in audio engineering. But after further studies in media management she has been involved in many projects about the implementation of blockchain technology into the music industry. 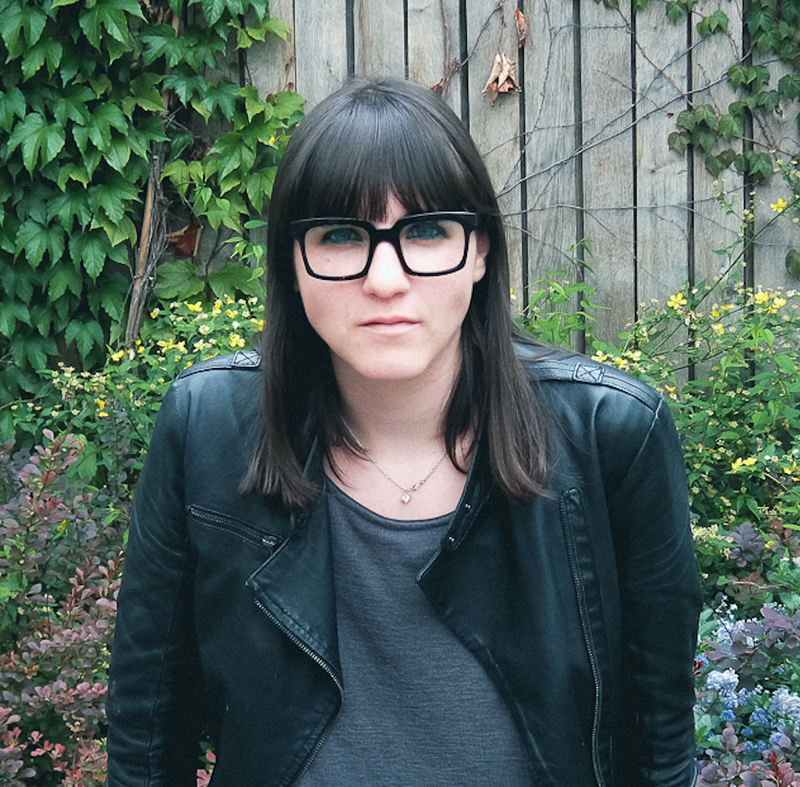 She is currently working with Imogen Heap as the Head of Research for Mycelia, where she is specialised in music copyright and licensing, blockchain technology, smart contracts and AR/VR. The 8th Vienna Music Business Research Days will be held again at the University of Music and Performing Arts Vienna from September 12-14, 2017. This year’s conference topic is “Unchaining the Digital Music?”. Digitization has brought music streaming to the centre of the music industry’s value-added network and new gatekeeping processes have been established by new and “old” players of music business. The morning session of the the invited conference day on September 14, therefore, will focus on new gatekeeping process in the digital business with a introductory talk by Daniel Nordgård of University of Agder/Norway and a panel discussion with Sally Gross (Westminster University, London), Sarita Stewart (Mike Curb College of Entertainment & Music Business, Belmont University Nashville/USA), Scott Cohen (The Orchard, London and New York), Jake Beaumont-Nesbitt (International Music Managers Forum, London) moderated by Daniel Nordgård. George Musgrave of the University of Westminster in London will wrap up the panel discussion with his talk on “Control and Autonomy in the Digital Music Business” providing a model for new gatekeeping processes in the digital music industry. In the afternoon session the keynotes by Paul Crick (Senior Managing Consultant, Digital Transformation, Media & Entertainment, IBM, Flintham/UK) and Wolfgang Senges (Strategic Consultant in Digital Media, ContentSphere, Berlin) will explain the fundamentals of blockchain technology and how it could disrupt the music industry again. Please read my blogpost “The Music Business in the Blockchain” to learn more about the impact of blockchain technology In the following panel discussion both keynote speakers will discuss the question “Unchaining the Digital Music Business?” by new technologies such as the blockchain with Carlotta de Ninni (Mycelia for Music Foundation, London), Kelly Snook (Professor of Media Arts Technology, University of Brighton/UK), Peter Harris (resonate, Berlin). On September 12, the VMBR-Days 2017 will traditionally be opened by the Young Scholars’ Workshop. Master and PhD students from Austria, Barbados, Canada, Germany, Serbia and South Africa will present their research result in a closed workshop to an international group of highly regarded music business researchers. The next conference day on Sep. 13 will be devoted to a broad range of music business research papers submitted by academics from all around the globe. On March 3, 2017, an international workshop on “The Blockchained Music Business” was organized by the Department of Cultural Management and Gender Studies (IKM) of the University of Music and Performing Arts Vienna and the Music Information Center Austria (MICA). Carlotta De Ninni (Mycelia for Music Foundation, London), Peter Jenner (Sincere Management, London) and Benji Rogers (PledgeMusic & Dot Blockchain Music, New York) were the workshop supervisors focusing on different aspects of the blockchain technology’s impact on the music business. In this first part of the summary of the workshop, you can read the results of the workshop group led by Carlotta De Ninni that discussed the opportunities and challenges of blockchain technology for artists. When the Economist article “The Trust Machine. The Promise of the Blockchain” was published in October 2015, a broader audience beyond the bitcoin community has become interested in the disruptive potential of the cryptocurrency’s technology. Meanwhile, further articles on the blockchain have appeared in the main press and Don & Alex Tapscott published “Blockchain Revolution” (2016), which highlights in detail the (revolutionary) impact of blockchain technology on the music business in chapter 9. We also discussed the relevance of the blockchain for the music business with the Blogchain-Hub founder Shermin Voshmgir in a music business research jour-fixe in Vienna on June 20, 2016. On March 3, 2017, Carlotta de Ninni (Mycelia for Music Foundation, London), Peter Jenner (Sincere Management, London) and Benji Rogers (PledgeMusic and Dot Blockchain Music, New York) will supervise the international workshop “The Blockchained Music Business” at the Department of Cultural Management and Gender Studies (IKM) of the University of Music and Performing Arts Vienna. After the workshop(16:30-18:00) our guests will discuss the opportunities and challenges of blockchain technology for the music business in a public panel discussion in the Large Conference room of IKM (Anton-von-Webern Platz 1, 1030 Vienna). In the following, I’m going to explain the fundamentals of blockchain technology and I outline its opportunities and challenges of the blockchain for the music business.